One of the most beautiful and unique Gothic Revival churches in North America is the church of the Nativity of Our Lord in St. Paul, Minnesota. This Neo-Gothic structure with English Tudor motif is one of many noteworthy churches in Minnesota, a land with a rich landscape of ecclesiastical architecture. This was the first church I entered as a baby in my mother's arms and I was baptized here on Palm Sunday, April 8, 1979. Nativity’s unique church design is the product of the once renowned ecclesiastical design firm, O’Meara and Hills Architects of St. Louis, Missouri and St. Paul, Minnesota. These architects, Patrick M. O'Meara (1890-1945) and James B. Hills (1888-1979), designed a handful of memorable Catholic churches, schools and institutions in the American Midwest, including Nativity rectory, school and church. In 1928 they published a book as a portfolio of their work showcasing their many projects with various interesting pictures, highlighting among other works the Nativity rectory and school project. Mr. James B. Hills was the main architect, with a branch office in downtown Minneapolis at 1004 Marquette Avenue. Hills modeled Nativity’s structural design loosely after St. Wenceslaus church, a previous project he completed in 1926 in St. Louis, Missouri. The Nativity design was bigger, measuring 171 feet by 81 feet, with a seating capacity of about 1,000 souls. The original church price tag was $300,000. In those days before a church was built, the diocesan business model was to first construct a rectory and school combination to accommodate the Catholic education of children, before the construction of a church. Meanwhile, Masses were to be celebrated in the school auditorium until funds could be gathered for the construction of a church at a later date. Nativity’s incredible history began with a hand-written letter from the Archbishop’s residence in St. Paul dated September 7, 1922. 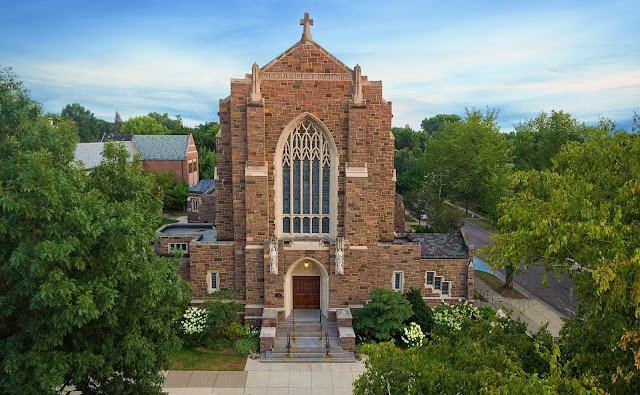 The letter from then Archbishop Austin Dowling was prompted by the needs of some five-hundred plus Catholic families in the newly built-up Macalester-Groveland neighborhood that were asking for a church-school combination. In those days much of this neighborhood of St. Paul was still covered with orchards, farm houses and cow barns. The property where Nativity now stands was originally part of what was known as the Wessinger Farm. With this simple letter addressed to “My dear Father Moore,” a humble immigrant priest from Ireland was called upon to be the pastor of a new parish, yet still to be named. The Archbishop wrote: “As you know there is neither land nor house nor money. I am at present finding out about a site for the church of which I think a good one.” The letter was received by Fr. Moore on the following day, the feast of the Nativity of the Blessed Virgin and he felt inspired and decided to name the church in honor of the Nativity of Our Lord. Nine days later on September 17, Fr. Moore was already celebrating the first Sunday Mass for his new flock in the auditorium of nearby St. Catherine’s College. Work proceeded with lightning speed and a new rectory and school were constructed within a year. On September 14, 1923 the new school opened with 311 pupils and 9 nuns teaching in the flowing black and white habit of the Sisters of St. Joseph of Carondelet; the style of the nuns’ beautiful garments dating from the time of their founding in 1650. In those days the nuns could be seen walking down Prior Avenue to and from their home at St. Joseph’s Provincial House on the campus of St. Catherine’s College. In 1952 Nativity built a convent for the nuns, today the parish center. The school grew so fast that new wings were added in 1927 and 1930. All this time Mass was celebrated in the school auditorium, which is still standing to this day. The school went on to reach an all-time high in 1966 with close to 1,250 students. Further school additions were added in 1960 and 2006. In 1937, despite the economic difficulties of the Great Depression, construction for the new church finally began. The cornerstone with its Art Deco lettering was uniquely laid not in the front of the church, but as part of the exterior sanctuary wall. With continued speed the church was built. The day of dedication of the newly completed church was April 16, 1939, celebrated by the Archbishop of St. Paul, John Gregory Murray. Nativity church, with its simple Gothic lines, boasts an exterior of seven different kinds and colors of granite, each cut in differing shapes. The granite colors are red, black, grey and seam-faced multi-colored, taken from quarries in the vicinity of St. Cloud, Minnesota and from one in Wisconsin. The cut stone windows of the church are of Indiana Bedford limestone, brought to St. Paul on railroad cars. The lights shining through the stained glass windows illumine the Nemadji ceramic floor tiles. The interior sanctuary is illumined like a lamp showcasing a wealth of carven chestnut paneled walls with wooden art and even a wooden baldachin over the altar, casting a lustre emanating through the church. The exquisitely carved lone sanctuary crucifix stands above the main altar, casting a gaze upon the place of sacrifice; easily one of the most beautiful hand-carved crucifixes found anywhere in the world. The simplex Art Deco altar is rose in color, set atop sanctuary stairs of imported red Verona marble from the north of Italy. The simple cross on the front of the altar is of the same matching red marble. Hoovering above this spectacle of radiant beauty is a rare sight in North America – a second large cross called a “rood cross” resting on a rood beam - similar to the rood screen, a common feature in late medieval church architecture. This beam is suspended just under the ceiling, displaying at its central axis the “Great Rood,” a life-sized crucifix displayed for all to see, towering high above in the middle and flanked by the Blessed Mother and St. John. This unique architectural element divides the chancel and nave, seen surmounting many church sanctuaries in some parts of Europe, intended to be parallel with the Communion rail below. The only words seen in the church are carved in wood and painted in yellow high above in the reposeful sanctuary, aspiring in their strength and taken from a popular hymn: Adore Te Devote Latens Deitas (I Devoutly Adore Thee, O Hidden God). The early visitors to Nativity who came for Mass in the lower level basement chapel with its green terrazzo floor were surprised when they noticed something different. The altar was free-standing and the priest was standing behind it for the duration of Mass. This was something unheard of in those days, causing Nativity to stand out in its early years as significantly avant-garde with its lower chapel boasting the first “Mass facing the people” altar anyone had ever seen. Although the sight of a priest celebrating Mass facing the people was something common enough in Rome in select basilicas, in North America in the 1930s it was something novel and edgy, at the fore front of a new trend that was soon enough to become commonplace in the 1960s. Interestingly, the movement for free-standing altars was inspired by studies proposed by the twentieth century liturgical movement and promoted by some Benedictines at the nearby St. John’s Abbey in Collegeville, Minnesota. The 1939 church dedication booklet spells out the change, reminding the faithful: “Members of Nativity parish should feel proud that they have the first (in these second thousand years) altar facing the people in the United States.” It continues, “They should also be grateful to their Most Reverend Archbishop, who has granted them permission to have their altar so, and to have the recited Mass*. Without doubt, there is no better way to show gratitude than by actually assisting at Mass more perfectly.” [*The “recited Mass,” Missa Recitata or “Dialogue Mass” was another novel innovation of the time, when the congregation would recite the Latin responses along with the servers. Before that time, the servers said the responses alone in the name of the people]. 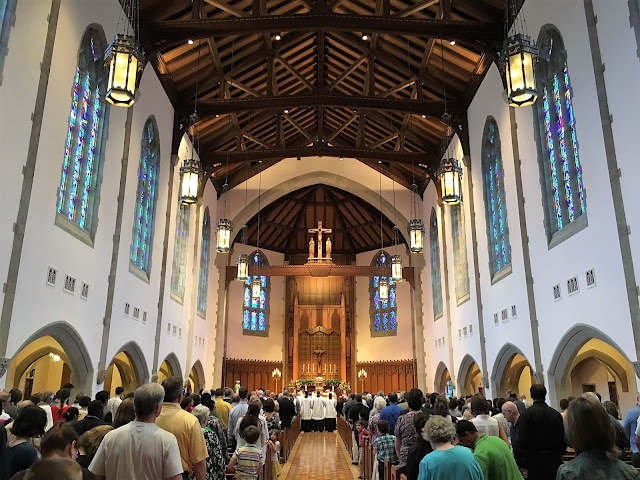 Nativity’s baby boomer parishioners have fond memories from their youth of a weekly packed Sunday Mass in the downstairs chapel, especially on Nativity’s patronal feast of Christmas Day, when two Midnight Masses were celebrated simultaneously upstairs and downstairs. 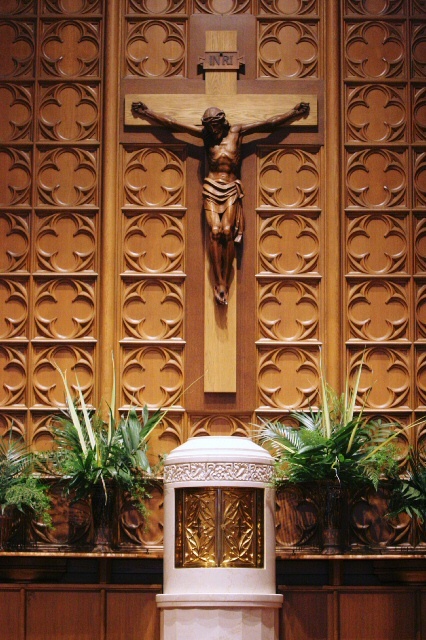 The precious wooden sanctuary cross in the basement chapel, suspended above the altar, was uniquely two-sided, depicting on the side of the priest the crucified Christ while on the side of the congregation the risen Christ. The chapel also had an organ. During an overly enthusiastic 1970s renovation the original scheme of the basement chapel suffered a thorough and injurious remodeling and nothing of the historic original altar or sanctuary remains. At the same time the original hand-carved Communion rail in the upstairs church was tragically removed and lost. One of the earliest documents in Nativity's parish archives is an article describing the first Christmas Mass in 1922, mentioning the fine choir and beautiful singing. The liturgical life of Nativity reached a golden age in the 1950s under the pastorate of Bishop James J. Byrne, auxiliary to the Archbishop of St. Paul and pastor from 1948-1956. The young bishop traveled a lot, but his daily Mass at Nativity was well attended, served by 4 altar boys, the tradition in those days. He installed a new Wicks pipe organ and hired local musician, Fr. Richard Schuler, to be a weekend assistant and choir director of Nativity's 4 choirs. For 16 years Fr. Schuler directed at Nativity, introducing the first orchestral Mass on Christmas Eve 1956, a tradition that continued for many years. That same month Fr. Schuler had the first performance of his newly founded Twin Cities Catholic Chorale, which is still in existence today, thriving at St. Agnes parish. In 1961 color photos of Mass celebrated at Nativity in the Extraordinary Form of the Roman Rite were featured in a hand missal and prayer book created for the laity, called the Cathedral Daily Missal, published by the E.M. Lohmann Company of St. Paul, once the city’s largest church supplies provider. Nativity's gifted architect, James B. Hills, lived in Delano, MN with his wife and 2 daughters in a house he designed. He passed away in 1979 and is buried in Delano Cemetery, never to be forgotten. The collection of his architectural records, known as the Hills, Gilbertson Papers, are kept under the care of the University of Minnesota, Northwest Architectural Archives. Nativity has long had a special connection with the Holy Land and the grotto in Bethlehem, the oldest church in Palestine. Fr. Patrick Lannan, Nativity pastor from 1986-1998, had a great devotion to the Holy Land and led five parish pilgrimages there during his tenure. The same tour itinerary with the same guide is now offered by Orbis Catholic Travel LLC. Fr. Lannan's favorite place to visit was the Basilica of the Annunciation in Nazareth. He always said that Christmas began there with Mary's "yes," her fiat, when Christ was conceived in her womb. He celebrated his last Mass in the Basilica in 1998, the same day of his untimely death, saying in his sermon: "Let go and let God." The message of Nativity church is the joy of Christmas, marking the beginning of our redemption through grace to the supernatural life. Carved in limestone above the main entrance on the front facade of Nativity are the words: Christum Regem Incarnatum Venite Adoremus: Come Let Us Adore Christ the King Incarnate!